If you’re visiting beloved-ones for the first time, I'd love get to know you. Please follow me for the latest updates or leave me a comment to let me know you were here! Thank you for leaving a comment letting me know! This fabric was one of few out there cute for boys... Hope you have fun with your Dino. Thanks for the tracing idea. It worked great!!! I used plain white paper taped 2 sheets together.. cant wait to make this. What a great little project! I made this today for my almost-2-year-old out of yellow fabric with coordinating yellow, green, light orange, and blue ribbons. Took *maybe* an hour and it turned out so cute that it's definitely going into the baby gift rotation. Thank you! Oh I'm so glad to hear it! Awesome...what a sweet idea. Two of my nephews are having a dinosaur birthday party in a few weeks and I was looking for something so their baby siblings can get involved...this is perfect! dear Kristen! I have my shop on etsy.com . Can I sale sensory toys, made from your pattern in my the etsy shop?? Liana, thank you for asking; that would be just fine by me! I look forward to seeing your baby dinos. So adorable. I'm going to make one for my little one to be. I'm going to put a jingle bell inside so he rattles. i want to make one (or two or three... it's a real baby boom around me this days). i have a question- is the fabric a regular cotton or with stretch? (hope i use the terms correct. english is not my mother tongue). It's so beauty! Hello My name is Virag, and I'm from Hungary. I'm going to make some dino to the kindergarten. I'll send you photos when I'm done. Thanx!! I found this through "I sew for free" email. Several little boys in the family right now, and I am going to try to make about 10 of these for Christmas gifts, to great nephews and ggreat nephews. 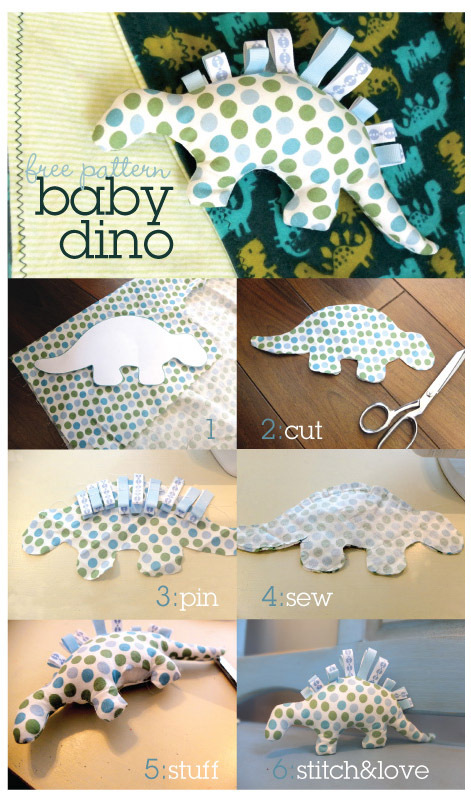 Hi- I saw this cute dino on Pinterest and plan to make it for my baby to be! Thanks for the inspiration and pattern, I will send you a pic once it's made! Hi- Thanks for the cute pattern (I saw it on pinterest) I will share a picture once I have mine done! I've made Mr Dino with great success! Thanks for the inspiration! Hi! 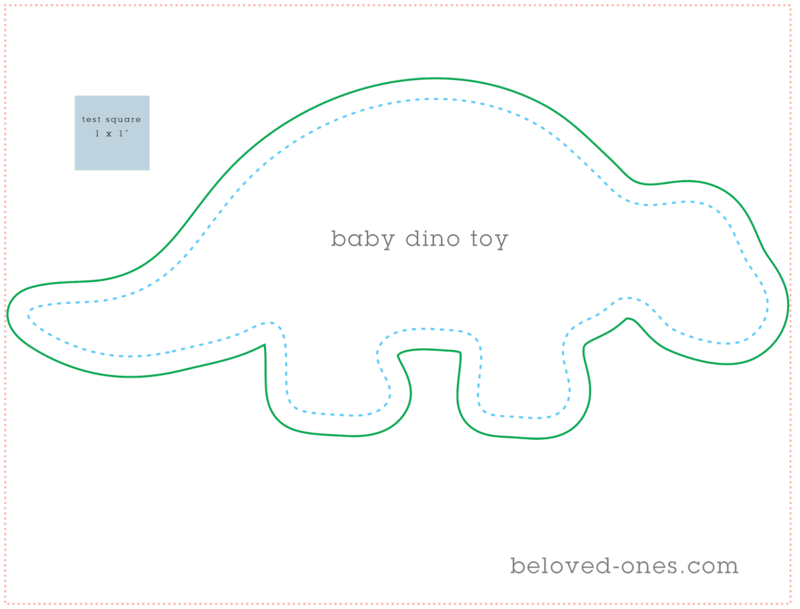 Found this when googling "dinosaur patterns" as I want to make a toy for my 16month old son who, in a house of big sisters, has somehow become dinosaur obsessed! And this pattern is perfect for a novice sewer. If it turns out am planning one for my new nephew and friend's first baby... Thank you! Hi! I found your cure Baby dino via Pinterest as well, and it is so easy to make :) Here is my first (def not last ;)) version: http://lilyseas.blogspot.nl/2013/10/baby-dino.html. Thanks for the pattern! Just made two of these for my girls. I used very large ric-rac along the back for spikes! Then filled with rice to make a bean bag toy. Very fun!! Thanks so much for the pattern, we will use it again for gifts. Found on pinterest and I LOVE it! making for my baby for Christmas! I would like to make this. Can you please just explain how you did the ribbon part? Thank so much. Super cute. Perfect for my little nephews! Love this pattern and will be making it for 6 infants (for their xmas gifts) that I care for on a daily basis at the childcare center I work at!! Thanks for the pattern. I have just made one for my 7-month old boy!! This is so easy and fun to make!! Saw this on Pinterest. Just ordered a new sewing machine and I cannot wait to make a few of these! Thank you for sharing your pattern. I found your post via Pinterest--thanks so much for posting this! I made a pair of these little guys for my kids this week (you can see them here). I am starting a shop on Etsy, and I was wondering if I might get your permission to use your pattern to make some of these to sell. Would that be all right? Saw this adorable little guy on Pinterest and I made it for my soon to be nephew. It is adorable. Thanks for sharing the pattern I love it! This is sooo adorable, if love to make it but my sister in law is having a girl. Any suggestions for a similar item for a girl? Make it in pink. Girls like dinosaurs too. I have made these, one for my son and one for my daughter. I have a shop, which sells handmade baby items and I was wondering if I could have your permission to make these to sell? Hello Kristen, thank you very much for that cute free pattern. There was an new Baby Dino "born" in Germany. Thanks for your pattern and instructions! Going to make one for a friends baby boy due soon and maybe even one for his 2 year old brother, I'm sure he'd enjoy snuggling it too! Hello :) I'm printing the pattern, but I dont know when will I make it :). I like it very much, it's very funny. About to attempt this! It looks so easy! Thank you for this wonderful pattern...and thank you for sharing so generously! Such a cute Dino. Will be making several. Thanks for sharing!! I can't wait to make some. I saw it on Pinterest. I just made one - took less than an hour. Would post a picture if I knew how! Thanks for sharing. Thanks for the pattern and sharing! What fabric have you all used? I was thinking flannel, minky, terry cloth, etc. Want something soft for any age. Perfect pattern for the little people being born this year, as well as the babies that are here already. Can't wait to make these cute Dinos! Hello! I make a baby Dino for my niece in France. I retake the tutorial in French for French seamstresses. With a link on your blog and the pattern. I saw in your baby dino to pinterest. I'm looking at your dinosaur dinosaurs made ​​it for my son. From France :) found on Pinterest ! I'm gonna make lots of dino's for birth's gift ! Please sew the tags shut before you insert them! Little fingers can get into the loops & twist tightly enough to cut off circulation. Better yet, use rickrack. Instead of ribbon, you can fold fabric strips so there are no raw edges & topstitch them flat. Those are also safe around fingers. I just made one for my son that's due in 8 week. I added some small tail spikes to mine to. It came out supper cute. Thanks for the pattern. I made two so far and plan on many more! Hi from Germany! Will make this cute little thing this weekend for the son of my boyfriends cousin. Found it on Pinterest – Thank you! Hi, absolutely adorable! We have also adopted. She's all grown up now. We love her so much! Hi! I made a baby dino! I put little jingle bells in mine because my little boy likes to shake everything. I then took it a step further and used your stencil to create a t-rex shape and a long neck shape. I added crinkle paper to the t-rex and a magnet to the long neck. I then made a leaf shape with another magnet so it kind of looks like the long neck eats the leaf lol. Thank you so much for the pattern! ADORABLE and easy peasy! I have to hem some pants for my husband today, I'm going to sew one of these while I'm at it!! Nice Info! Most of the demanded kids toys offered online are as babushka doll, puzzles, wooden toys, musical toys, robots, soft toys and more. Very nice little dino. Thanks for the fantastic idea. Thanks a lot for sharing this nice pattern. I will show you soon. Not sure if there's a way to post a pic but I just made two of these cuties for a friend's lovely three year old daughter and a new baby daughter on the way - grey chevron with a variety of yellow ribbons. SUPER cute!! Thanks so much for the pattern! I have just made a dinosaur cot quilt and will use the leftover backing fabric to make one of these delightful baby dinosaurs. Thank you for the pattern. I made 2 for my newborn nephews for christmas!! so simple and easy! loved doing this quick project so they can have something handmade from their aunt katie! Thank you for posting! Starting the dino colony her in New Orleans. The ribbon that you used? is that just regular ribbon you folded over and sewing in? Thanks for sharing your pattern. May God continue to bless you and your family. So.... There are only 2 feet? Not 4? Awesome pattern! I made a dinosaur, and it turned out so cute! Thanks! Thank you sooo much for sharing your very cute pattern! Hi! My name is Kelly and I blog at Just Another Project (www.kellyjdesigns.com). I am working on a round up post of sewing projects for baby that use up leftover scraps of fabric. I would love to include a link to your Baby Dino Pattern . Would it be all right with you if I included your link in my round up, along with a photo from your tutorial? After having this pinned for months, I finally made it! It turned out so cute. One of these days I'll get around to blogging about it and will be sure to link back to you. The pattern isn't working for me...is there something wrong with it? id love to make your dino, but cant see the pattern. Can't find the pattern through the link you provided. Can you upload a new one? i am so sorry . but i cant find the pattern through the link you provided. please helppppp!!!!!!! That worked for me too! Thanks for the tip! Yes, thank you! The link is broken but this helped! Hi! your blog is great full and image is nice use,you use a different type content thanks for sharing this post. I second (fourth or fifth?) the broken link. Is there another way to get to the pattern? Here is the Dino my friend made for me! thanks for sharing. Love this soft toy and your story of the three children you adopted. they are beautiful gifts from above. I would love to be able to make this beautiful toy. It looks like a perfect pattern, however the link does not seem to be working any more. Would you please be able to send me the pattern? I look forward to hearing from you. Thanks!! I would love to make this Dino... but the link to the tutorial doesn't work. Can you fix it? thanks!! Thanks for cute pattern. I made baby dino for my little son Phillip. Now dino lives in Poland :) Greetings! I finally found the pattern! The link for the dino sewing pattern no longer works. Please help I want to make this for my little one. This is my first time visiting your site. I saw the baby dino on Pinterest bc my sister is 8 months pregnant and her shower is this coming weekend. I am hugw into crafts and even though I got a million gifts, including a personalized onesie, I wanted to see if I could get some more ideas on something personal I can make. My boyfriend is obsessed with dinosaurs,and so this immediately caught my eye. The baby dino is so darn cute and I can't wait to make it! When I do, 1 will certainly share a pic. Hello my friend! I would like to tell you that this write-up is awesome, great written and include almost all important info. I recently came to know about http://toysuae.com/, their Baby Toys are very effective. Made a little Dino tonight! It's only supposed to have 2 feet right haha my baby is already loving it!! Thank you for making this pattern available! Can't wait to make this. Just finished one of these little dinosaurs here in Texas, thanks for the pattern and idea. SUCH a cute, fun and easy project for baby! I just made two baby dinosaurs this weekend, one blue and one green, as Christmas gifts for the two new babies in our family. They turned out cute! Thank you for the idea and tutorial! Спасибо за отличную идею и за шаблон выкройки. I really appreciate your work and very amazing and important information about the Custom embroidery baby gift which have share in this blog. I'm going to make these for my friend's twin boys due in April. Am I able to use your pattern to create my own to sell? Hi! I found your site through Googling "sew baby gifts". I plan to make a dino for my 13th grandson born in March 2018 and for a baby shower for my good friend's first baby coming in May! Ty for the trace idea. I couldn't find a pattern to print and was just wondering if tracing would work! Thanks again for the pattern. Thank you so much for the pattern. My lil one loved it totally. He is 6 months now and this one is a very good sensory toy . Thanks for sharing this site, it is very informative for the business personals. That sure is a masterpiece from you. Keep on continuing with this. Also visit our baby store uae for new born baby & toddler products. free classified ads canada for baby items and baby care products at very cheap and affordable prices on Catchfree.ca. The biggest free classified ads canada website for baby items. A toy is the best gift for babies because they learn a lot of things with them and like that very much. Always choose that toys which are useful for learning and enhanced their children's memory, Every age group gifts are different because they learn something new at the age group. Buy Cheap Babies toys online in Jordan then come with us. Nice post ...thanks for sharing this ideas. it's helpful for me. Thanks for sharing the information.it helps me a lot.Thanks for the tracing idea.